An international research team led from Glasgow University has discovered a new kind of bacterium that could fight parasites in humans, animals and plants. The bacillus - called "golden death" - was found in two pieces of rotten fruit. It has proved fatal to several types of parasitic nematodes, otherwise known as roundworm. Roundworm parasites such as hookworm affect humans. Other varieties cause widespread illness in pets and livestock and some can lead to major losses of crops. Treatments already exist but roundworms are starting to become resistant. The Glasgow-led team has found two new strains of bacteria that kill the worms in the laboratory. The scientific name for the new species is Chryseobacterium nematophagum. Its nickname "golden death" is more likely to capture the popular imagination. In the laboratory, the bacteria ate the worms from the inside out. 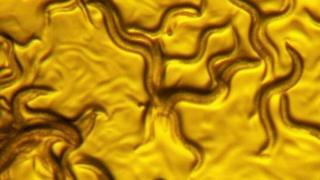 As the bacterial colony grew it turned the nematodes yellow - which is where "golden" comes from - and produced what the researchers describe as a "pungent" smell. "Golden death" works fast. Larvae of the roundworm C. elegans that fed on the bacteria stopped moving within an hour. Half were dead within four hours, all of them in seven. After 24 hours had passed only traces of the worms were left. The team included researchers from Glasgow University's Institute of Biodiversity, Animal Health and Comparative Medicine and School of Veterinary Medicine, the Institute of Biology at the Ecole Normale Supérieure in Paris, and the Wellcome Trust Sanger Institute in Cambridge. It was led by Glasgow's professor of molecular and biochemical parasitology Tony Page. In effect, they "auditioned" many different types of bacteria gathered worldwide. They found them in flowers and compost from France, soil from the United States, a German chicken. But none of those bacteria worked. The killer strains were found in roundworms on just two pieces of rotten fruit - an apple in Paris and a fig from the India city of Bangalore. Writing in the journal BioMed Central Biology, the team said the bacteria could one day lead to better treatment of roundworm infections in animals, plants and even humans. Prof Page said the discovery could lead to "a future means of controlling increasingly problematic parasites that currently are a major burden to public health and the farming industry".